We arrived in Gilsland to lovely warm sunshine, so to take advantage, we had a quick lunch and then pottered out to explore the village and some more of the Wall. 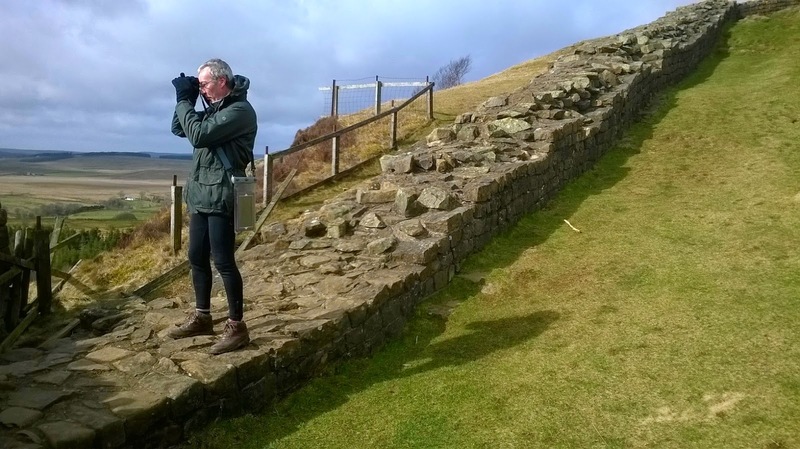 We visited Poltross Burn Milecastle. This is known locally as The King's Stables, and is one of the best preserved milecastles on the entire length of Hadrian's Wall. A milecastle is a small rectangular fort built during the period of the Roman Empire. They were placed at intervals of one Roman mile along the length of the Wall, and in total, 80 of these structures were built. Usually, their purpose was to guard a gateway through the Wall and each had a garrison of between 20 and 30 soldiers. Heavy rain and wind kept us in until after lunch time, but then we decided to brave the elements and ventured out towards The National Park. First stop was the 12th Century Thirlwall Castle which was abandoned by the last of the Thirlwall family in the 1700s, and thereafter, became a neglected ruin until 1999 when Northumberland National Park Authority took over the management to protect it from further dereliction. Within it's walls it was quite easy to let your imagination run wild and evoke the noises, scenes and smells (phew) of how it might have been in times gone bye and the information boards reinforced this. It was also easy to sense the danger that the risk of falling masonry posed, especially in the strong winds, so after a quick look round we legged it to safer ground. Our walk continued up and down the very steep hills with far reaching views on both sides, but after a while the wind took its toll and we decided to wend our way back using the lower track. We thought this would offer us some shelter but we were very much mistaken, and the battle into the strong headwind continued until we finally reached the comfort of the Tardis. For our final day in Gilsland we decided to cycle. We set out late morning after allowing time for the sun to wake up, and headed off following Sustran's route 72, which more or less follows the line of Hadrian's Wall . First point of interest should have been Birdoswald Roman Fort but like many other visitor attractions along the way, it was closed. Undeterred, we continued on towards Lanercost Priory stopping occasionally to view more relics and to soak up more of the history. The Priory was built sometime between 1165 and 1174 and dedicated to St Mary Magdalene, and to this present day, the chapel is still in use for regular services. To the rear of the chapel the Priory is mainly a ruin but there is evidence in the form of Roman inscriptions that stones from Hadrian's Wall were used for it's construction. The graveyard also had an eerie atmosphere, with many of the very old stones having their inscriptions completely obliterated by the weather and creeping lichens. The Site is presently managed by English Heritage who have turned some of the old buildings into holiday lets and other commercial enterprises. We continued on our way through Brampton and onto Talkin Tarn country park which provided a very pleasant lunch stop. Soup and sandwiches again made all the more delicious by the odd ray of sunshine which managed to peek out now and then. Lunch over and starting to feel a bit cold, we decided to burn a few more calories, and generate some heat by peddling quickly on our continuing journey which took us up more undulating hills. 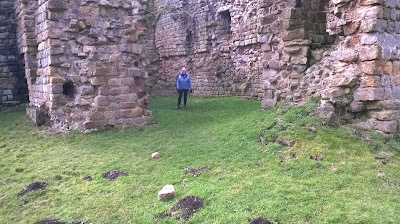 We travelled through the hamlets of Talkin (but no reply), Farlam, Hallbankgate and into Naworth Park and then back to Lanercost. At this point we needed to cross the River Irthing, and a choice of two bridges was available. The first being of modern day construction and the other a disused pack horse bridge that was constructed in 1724 costing the grand sum of £493. This bridge was only relieved of vehicular traffic in 1962, and it is still open to pedestrians now, so they really got there monies worth! The next little village we passed through was called Low Row, but unlike it's name, it was stuck at the top of two very steep hills - we even had to get off and push up the last bit of one of them. Luckily, at the top we were forced to rest while a farmer herded his sheep and lambs across the road and it was a lovely site seeing them skipping and jumping, and shouting 'mint sauce' didn't seem to worry them at all! It's moving day again tomorrow and we are heading towards Alnwick so we will continue our story form there shortly.